The episode left me cold though, and perhaps it’s because I went in with so many specific expectations of it. Namely, I expected different calibration of Girls’ dramatic and comedic elements. Depending on the episode, Girls typically leans towards drama or comedy. In its best episodes, the show pitches straight down the middle—“Flo,” for example—but that’s a formula so precise, Girls can only nail it every so often. I tend to prefer the show’s more dramatic episodes over those in which it most closely resembles a traditional sitcom, so certain things ring false for me, even if I find them funny. “Welcome To Bushwick a.k.a. The Crackident” comes to mind, if only because, like “Triggering,” it was written by Dunham and executive producer Jenni Konner. That episode made me laugh, which is a relief, because who wants to be the person who can’t find joy in Shosh high on crack in Brooklyn? But it played a bit more broadly than the version of Girls I most enjoy, so I could never totally invest. “Triggering” struck me the same way because it reaches for laughs even if it has to lean over plausibility to get to them. As different as the two shows are, Girls frequently reminds me of 30 Rock. Both shows are the creation of women with unique comic voices, and both star their creators as fictionalized versions of themselves pushed to grotesque extremes. Dunham and Tina Fey are both widely celebrated because of how extremely unflattering their characters are. Vanity and comedy can’t exist within the same space, and in a culture with such stringent physical expectations of women, it’s a brave exercise for a woman to reimagine herself with such an absence of vanity. But it’s easy to overshoot that target, and while Dunham doesn’t go overboard as much as Fey did with Liz Lemon, the “Liz Lemon is hairy” brand of self-deprecation was easier to pull off on show as intentionally cartoonish as 30 Rock. Girls is not intended to be a live-action cartoon, so it has to be far more careful of poking fun at Hannah in a way that feels over-handled. That’s the issue with “Triggering.” It goes to such extremes to indict Hannah’s narcissism and social awkwardness, it stops resembling anything recognizable. That will play differently depending on whether you get more mileage out of Girls-the-drama or Girls-the-sitcom. 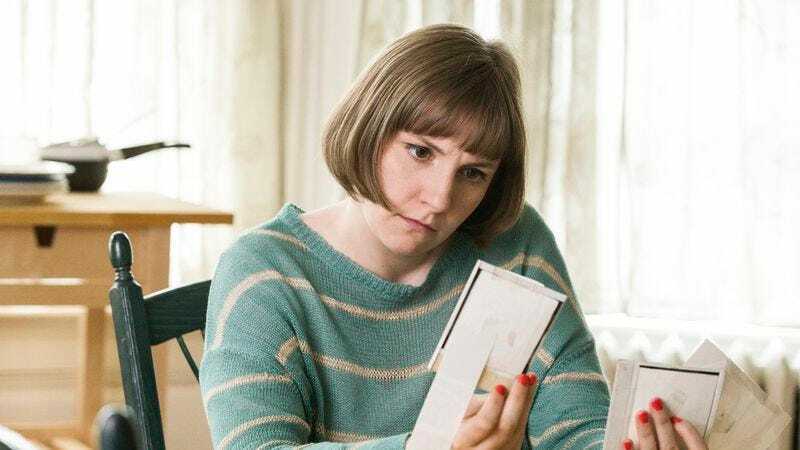 Even when evaluated by sitcom standards, a scene like Hannah’s peer critique doesn’t completely work because it’s an effort to eschew vanity that goes so far overboard as to become vanity. I’ve been in enough grad-school workshops to know how sharp-elbowed and contentious they can be, but Hannah’s peers seem to care too much about Hannah. Their feedback on her work is so hostile and personal, the scene doesn’t resemble real life so much as a daydream Hannah would have in the bathtub. Hannah, who drum-rolls her piece by calling attention to its more “triggering” aspects, would love nothing more to incite her classmates to this kind of ad hominem. That kind of reaction is too easy to dismiss or, as Hannah later does, attribute to the oversensitivity of someone for whom a personal chord was struck. This is not the horror of an MFA program. That comes when a classmate is like, “Oh…um…yeah, it wasn’t really my thing.” Fierce attacks like the ones Hannah gets for her piece are tough to hear, but they’re at least active engagement. What most unnerves someone like Hannah is casual indifference, which is the most likely reaction in this context. Exploring that feels like a missed opportunity because it would just as effectively push Hannah to emotional extremes, but would better encapsulate what’s so tough about a writing program. Aspiring writers grow up being told how good they are at writing by their parents, teachers, and friends, then swim into a larger pond full of people who were also told that, and who are objectively more talented. Those people don’t spend all their time thinking about a Hannah Horvath. They’re not eagerly awaiting the opportunity to take a lesser writer down a peg. They only pay attention to people who seem like genuine competition. In “Triggering,” everyone and everything pays special attention to Hannah. She isn’t alone and ignored in an unfamiliar environment, because the whole universe wants to actively engage with her. A testy bookstore cashier (Brooks Whelan) needles her about her overextended credit. She gets raked over the coals for her piece. Someone steals her bike. There’s a cellular dead zone stalking her every move. Even the bats can’t resist her. Then Elijah drops everything to rush to her side, though I’ll be the first to admit that watching a homeless woman fist herself on your stoop is the sort of thing that demands a relaxing escape. Elijah’s arrival brings with it some hilarious moments as he and Hannah recapture the carefree debauchery of undergrad, but those scenes feel like “Bad Friend” set in Iowa, an attempt to split the difference between exploding Hannah’s world and maintaining the show’s status quo. But again, I’d imagine “Triggering” plays totally differently for someone who cottons to Girls-the-sitcom, especially because the episode was so beautiful to look at. Dunham directed this one, and clearly had a great time with the new scenery. There are just a lot of beautifully composed shots in the episode, so many it’s hard to write off. But I’m hoping Hannah’s time in Iowa will yield some more grounded moments, even with Elijah nearby. Housing costs are so relative it’s literally impossible to live in one place and conceive of what people pay for housing in another place. So tell me Iowa experts: $800 to rent that house. Is that real life? Shoshanna: “I hope someday I know the passion that Huck feels for Quinn.” That’s my early contender for best line of 2015. Of course that would be Shosh’s interpretation of Scandal’s most dysfunctional relationship, which is a significant distinction for that show. Elijah is lying. No one has ever referred to anyone else as “Blake Lively’s husband,” and that includes Blake Lively’s husband. If you’d have told me I’d live to see Hannah and Elijah grinding on the same guy, to “Get Low,” in Iowa, I’d have called you a liar. How did Marnie manage to irritate the hell out of me in a two-minute video chat?